On Thursday August 16th, it became official that Lake Placid will be hosting the 2023 Winter Universiade. This is an eleven-day event that was started in 1960 and occurs every two years, and is expected to include over 3,000 students from over 600 colleges all over the world. This will be Lake Placid’s second time as the host city, and is still the only place the games have been hosted in the Western Hemisphere. Sporting events like hockey, skiing, snowboarding, curling, and figure skating will be taking place in both Lake Placid itself and at other venues throughout the North Country, including SUNY Plattsburgh and Whiteface. This year, the Plein Air Festival is celebrating its 10 year anniversary. As part of the celebration, an art show has been on display at the VIC featuring five artists who have been involved with all 10 festivals. Plein air painting is the act of painting outdoors, and participants in the festival only have one week to paint a variety of sights from surrounding areas. The VIC property, as well as the town of Saranac Lake, has been a destination of the festival for many years. This year, Jay Brooks of Callicoon, NY won the 1st Place Award. I guess we should probably start with a basic overview of what exactly a cricket is. True crickets are all in the family Gryllidae, which evolved about 250 million years ago. These species tend to have long antenna, have tympana (ear-like organs) on their front legs, are nocturnal, jump instead of fly, and rub their wings together to make sound. Now, this may sound a lot like grasshoppers, but grasshoppers are actually in a completely different suborder (Caeliferans as opposed to the suborder Ensifera that crickets belong to). There are a few main differences between crickets and grasshoppers, which include grasshoppers being active during the day, most being able to fly extremely well, having tympana at the base of their abdomen, and making sound by rubbing their hind leg against their wings. Grasshoppers also tend to be larger and more brightly colored than crickets, which is a quick and easy way to tell which one you’re looking at, instead of trying to find where their tympana are, which are some of the smallest of any animal. Did you know there are over 900 species of cricket in the world? We have a few different species of crickets here in the Adirondack Park. The most commonly seen/heard include the House Cricket, the Field Cricket, and, Danielle’s favorite, the Two-Spotted Tree Cricket. 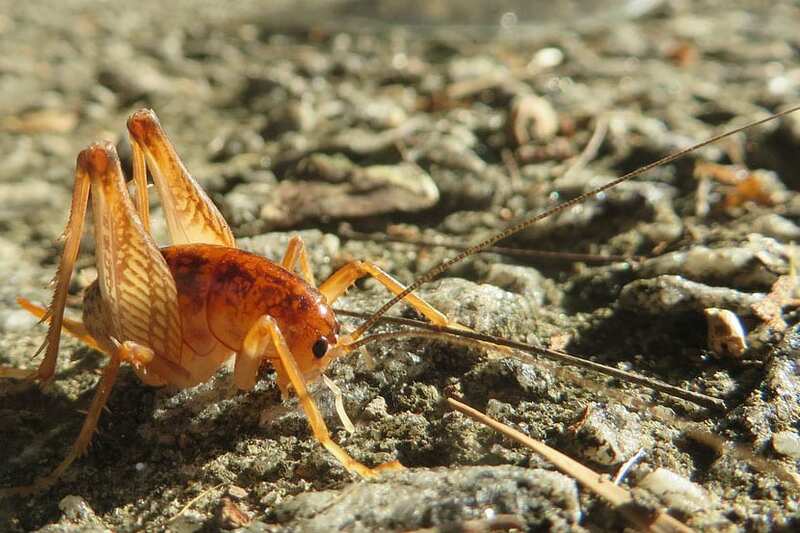 Others found in the Adirondacks include the Northern Mole Cricket, the Spotted Camel Cricket, and the Red-Headed Bush Cricket. A lot of people go their whole lives without seeing a cricket, but it’s hard to imagine people never hear them. After all a group of crickets is called an orchestra for a reason! Even in large cities, some species like the House Cricket have adapted to that wildly different environment and are commonly found in homes. Most of what people hear are the male crickets’ calling sounds, which are used attract females of their same species. But there are other types of sounds they make, too, including: their courting sound, which is used when females get closer; their after-mating sound, which is thought to encourage the female to lay her eggs right away, instead of finding another male to mate with; and their aggressive sound, which is used when another male or predator gets too close. Most female crickets don’t make any sounds, although there are some species that will make a short answering call to the males. Aside from their role in reproduction, cricket chirps have cultural significance as well! Depending on where you are, crickets may be considered good luck, a warning of impending doom, signs of money, or even a tasty snack! In recent years, crickets have been increasing in popularity due to their potential use as a food source. Some say that crickets will save the world by providing a high protein, low fat alternative to beef and other meats. Crickets are more efficient at producing biomass proportional to their food intake than cows, pigs, and chickens. On top of this, crickets take up less land space, water, and food resources, and produce less greenhouse gasses, especially methane, than the current meat industry. Do you think crickets are the future of food? Currently, the biggest downside is the cost of starting up cricket farms for commercial consumption. Due to insects’ “ick” factor in western cultures, most people don’t find them appetizing. In order for crickets to become a solution for our current food industry’s environmental impact, they first need to increase in popularity. Speaking of snacks, if you’ve enjoyed our podcasts stay tuned for our next episode! We will be talking all about wildflowers that you can eat!